40% High efficiency biocide (by weight). Laboratory proven 99% kill of disease-causing bacteria. Combats a broad spectrum of harmful bacteria including those causing the common cold and other respiratory ailments. pH neutralizers help protect pan against corrosion. 3 month, 24 hours/day service life in all climates. Consistent ppm release per day. Sealed, tamper proof housing prevents skin contact with biocide. 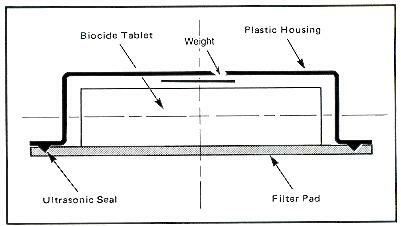 Filter pad meters biocide for consistent chemical release. Water saturated filter pad and weight prevent flotation. Designed NOT to clog drain hole. Can be placed either vertically or horizontally. Low profile - fits most cooling equipment. Place ANTI-CLOG under cooling coils in middle of pan length. It goes to work immediately upon contact with water! The Anti-Clog, is designed and approved only for use in drain pans of Air Conditioning Systems and Refrigeration Systems. 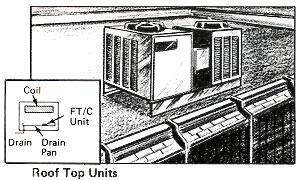 Cooling equipment produces cold air by passing warm air over cooling coils. This cooling action causes condensate (water droplets) to form and drip off the cooling coils, similar to the droplets formed on the glass of a cool drink on a hot day! Have you ever seen water dripping out of a window air conditioner? This is a common example of condensation. 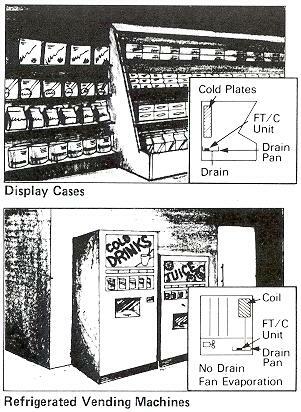 In large commercial cooling equipment, condensate cannot be allowed to drip out onto passersby or other objects. Therefore the condensate must be collected in a drain pan inside the unit. When enough droplets collect, the condensate begins flowing to a drain hole. IT IS HERE IN THE DRAIN PAN THAT POTENTIAL TROUBLE BEGINS! Bacteria, naturally present in water including condensate, produce "SLIME" as a waste product. Block the drain hole, causing the drain pan to overflow, resulting in costly flood damage. Provide an ideal breeding ground for harmful bacteria including those causing the common cold, asthma, fatigue, headaches, flu, allergies and the bacteria known to cause deadly Disease. The Anti-Clog # 1 Kills Slime and Disease-Producing Bacteria! WHERE is the Anti-Clog # 1 needed? 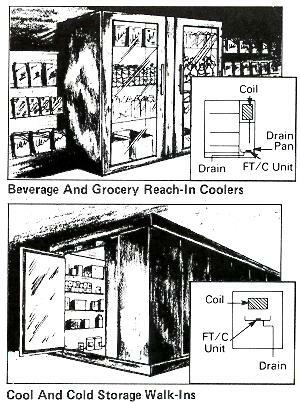 WHEREVER AIR CONDITIONING/REFRIGERATION IS USED!!! WHEN is the best time to install the Anti-Clog # 1 ? Initial placement: Install the ANTI-CLOG #1 during preseason maintenance programs prior to system start-up. Follow-up maintenance: Replace the ANTI-CLOG #1 every 3 months for the duration of the cooling season. The spread of harmful bacteria bred in drain pans. HOW does the Anti-Clog # 1 work? The ANTI-CLOG #1 is a biocide (quaternary ammonium) tablet enclosed in a plastic housing. Ultrasonically sealed to the housing is a white filter pad. Water is absorbed by the filter pad and "wicked" to the tablet. The release of powerful biocide is initiated as the water begins dissolving the tablet. The filter pad controls the release of biocide resulting in a 3 month service life in even the hottest and most humid climates! The ANTI-CLOG #1 works either horizontally or vertically at angles up to 60°, without compromising performance. WHY is the Anti-Clog # 1 a superior product? 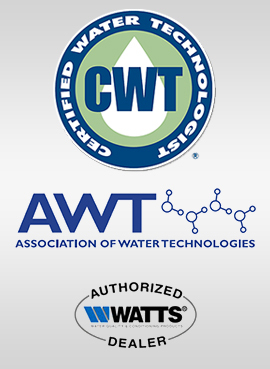 It is the ONLY product on the market permitted by the EPA to make a Disease Causing Bacteria kill claim! Its safe to use, sealed, tamper-proof housing prevents contact with biocide! ANTI-CLOG #1: INEXPENSIVE HEALTH PROTECTION AND PREVENTATIVE MAINTENANCE! In laboratory tests the Anti-Clog formulation has been shown to inactivate pure cultures of Disease Causing Bacteria. The ability of this formulation to control the growth of or inactivate bacteria in air conditioning condensate drain pans exposed to organic material and other microbial contamination has not been documented. A direct relationship between the presence of this bacteria and the potential for human disease has not yet been proven. FT/C : FOR EQUIPMENT UP TO 5 TONS. AT/C: FOR EQUIPMENT OVER 5 AND UP TO 15 TONS. NOTE: FOR LARGER EQUIPMENT USE MULTIPLE UNITS. DO NOT USE in Humidifiers, Humidifier Sections In Air Conditioning Systems Or Evaporative Coolers IF Heat Lamps Sit Directly Over Or Near Drain Pan Where The Anti-Clog #1 Has Been Installed. FT/C - 2 3/4" long x 2 1/4" wide x 1/2" high, contents 3/4 oz. AT/C - 3 5/8" long x 2 3/4" wide x 7/8" high, contents 2 1/8 oz. NOTE: Not for use in applications exceeding 150°F. Condensation Pan Treatment (3/4 oz. product/unit) Item is priced and sold per unit. Packaging is 24 Units/Box and 6 Boxes/Case.